Looking to gift, reward or incentivize someone? 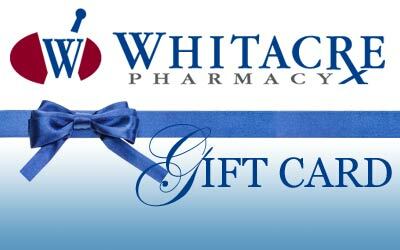 Whitacre Pharmacy gift cards are a perfect gift for friends and family. Stop by your local Whitacre Pharmacy to purchase a Whitacre Gift Card today or contact us for information on how you can receive your gift card by mail. You can also check your card balance whenever you want, by entering your card # below. Your Ticket to Real Savings - Tired of gimmicky store rewards cards that make big promises, but fail to deliver? We are. That's why we created WhitaCares. We believe that customer reward programs should actually save our customers money on the things they use most, not just a few cents on items they don't care about. So, when you sign up for your WhitaCares card, you'll immediately start earning meaningful rewards that will help your money go further when you buy everything from prescriptions to convenience store items. You deserve real rewards, not gimmicks. Stop into one of our three convenience locations and register for your FREE WhitaCares Loyalty card today! Use your WhitaCares Loyalty Card to receive points and discounts at any Whitacre Pharmacy. Your card cannot be exchanged for cash, check or credit. Please treat this card carefully. If lost or stolen, contact Whitacre Pharmacy immediately.